The Việt Nam Football Federation (VFF) will sell 25,000 online tickets if Việt Nam qualify for the ongoing AFF Suzuki Cup 2018’s semi-finals, according to VFF general secretary Lê Hoài Anh. Anh said the VFF held an urgent meeting to deal with difficulties in selling tickets to avoid touting. The VFF sold tickets for the match between Việt Nam and Malaysia from VNĐ150,000 (US$6.5) to VNĐ400,000 ($17). They sold through public bodies, online registration and in person at the stadium. 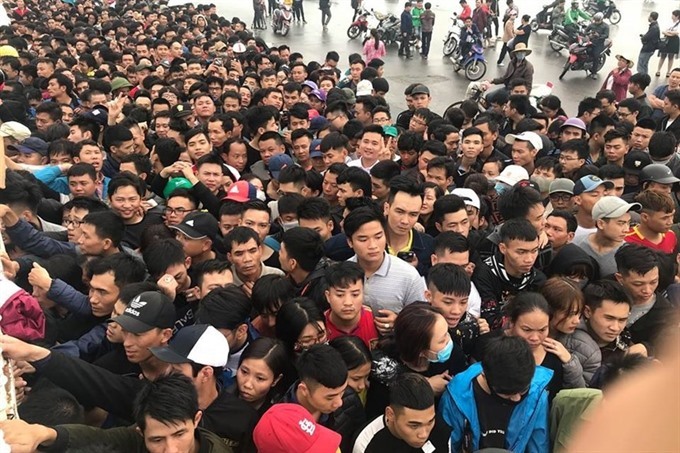 11,000 tickets were sold via public bodies, 3,700 tickets online and fans had to queue to buy 9,000 tickets at Mỹ Đình National Stadium. The rest of the tickets went to VFF’s partners and sponsors. However, the VFF’s supply didn’t meet fans’ demand, with many unable to secure tickets through legal means so had to buy them on the black market for a price up to tenfold the original value. Tickets sold through public bodies and huge queues caused problems for fans and the VFF. “We are enthusiastic fans. We supported Việt Nam through all matches. We sent an official dispatch to the VFF to buy tickets but the amount of tickets were not enough for fans. We registered for 1,000 but the VFF said they only had 700. But in fact, the VFF couldn’t supply 700 tickets. Finally, there were only 300 tickets for us,” said Nguyễn Văn Luận, a member of the Việt Nam Football Supporters Association. “When tickets don’t come to real fans, we are forced to buy tickets on the black market. A pair of tickets in D or C Stand is only VNĐ300,000 (US$13) but we have to buy them for VNĐ 1.3 million ($56),” Luận added. Due to these issues, Anh said the VFF will sell all tickets via online, instead of through public bodies and at the stadium, from early December if Việt Nam reach the semi-finals. “We worked with our technology partner to upgrade the link system to ensure 1,000 people can buy tickets at the same time,” said Anh. Besides, the VFF will work with the Việt Nam Post to send tickets to fans quickly. If fans don’t receive tickets via post, they can get tickets at the VFF’s office on a fixed day.